Large tub of Turmeric latte. 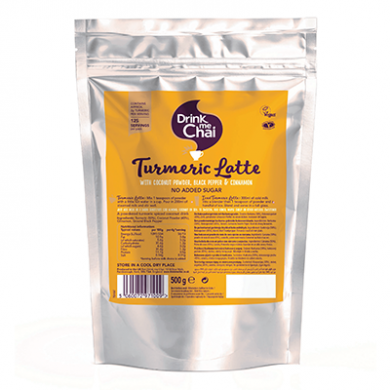 Made with four ingredients: turmeric, coconut milk powder, black pepper and cinnamon and containing no added sugar, it aims to appeal to consumers looking for an interesting healthy alternative to traditional hot beverages. Turmeric has been used in India for thousands of years as both a spice and medicinal herb. Turmeric contains curcumin, which has powerful anti-inflammatory effects and is a strong anti-oxidant, so not only does it taste good it does you good too. It’s a way of combining convenience and health – a way to add a wonder spice to everyday living. We are hoping both our current chai latte fans and those looking for something different and healthy will love this authentic new variety.